This kitchen dining area is a welcoming area for lunch with friends or enjoying a family breakfast. The armless leather chairs and artistic lighting fixture give life to this modern kitchen...Look outside the tall windows as you eat your meal. Cooking is fun when you have an elegant farm-style kitchen to use! 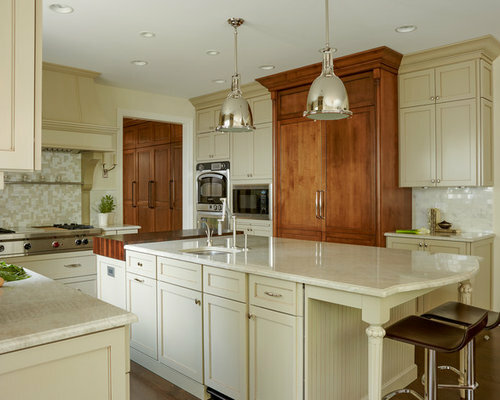 The white farm sinks and over-sized island are chosen to perfectly compliment the painted cabinet doors and matching painted hoods. Isn't the lighting in this room cool? Another angle of this modern-farmhouse kitchen to show off the stainless steal appliances, prep sink in island, and hidden refrigerator!